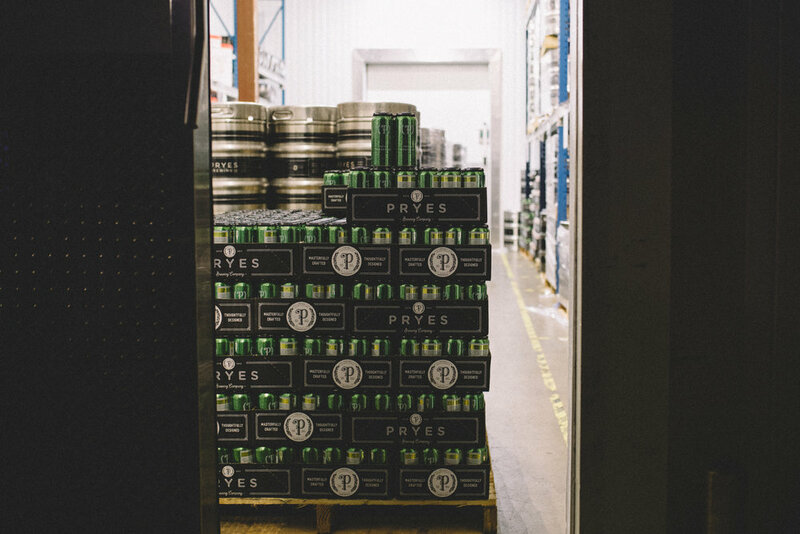 Masterfully Crafted & Thoughtfully Designed, Pryes Brewing takes its time to focus on brewing one batch at a time. Food: Made in-house by Cason Italian Eatery. Outside food and beverages are prohibited. Events: We have 2 Semi-Private Spaces available for Rent. Growlers: Pre-filled (we do not fill growlers). No bottle fee! Fun: Feather Bowling (leagues Tue, Wed & Sun) scenic views, bike paths & Minneapolis Bouldering Project. The 6,000 sq. ft. taproom was designed by the architecture firm Little Box Inc. and offers guests the choice to enjoy riverside views on the patio, share a pint with our patrons in the communal area, order woodfired pizza in the parlor, watch a game of feather bowling near the court, or have a cozy conversation in the lounge. The taproom decor, designed and built by Atom Pechman of Form From Form, reflects the industrious aesthetic of craft beer production while combining the natural elements of the surrounding area. Our Signature dry-hopped and citrus-forward IPA with a smooth, malty finish. The perfect balance of West Coast hops and East Coast malts. Our Juicy, double dry hopped IPA comes straight out of the Midwest. Cryo Mosaic, Amarillo and Centennial hops incite a massively hazy experience. Our Russian Imperial Stout is brewed with 8 different high roasted malts. The unique double-fermentation method creates the dark toffee and chocolate-like roasted flavor. Our double haze IPA is brewed with Sabro hops grown in the mountains of New Mexico. Sabro provides a complex blend of tropical fruit, tangerine, and coconut. This IPA also includes El Dorado and Azacca hops to round out the experience. Gold Medal Winner of the 2018 North American Brewers Awards. A complex blend of 6 different malts and oats crafted to create our interpretation of a Dry Irish Stout. An approachable stout with Dry, Roasted and Smooth flavors. Our Milk Stout is brewed with chocolate wheat and roasted grains creating rich cocoa flavors. A small amount of milk sugar is added for a hint of sweetness. Our signature Midwest IPA enhanced with the richness of blood orange. A Bold and subtly fruited IPA with a smooth, malty finish. Our evolution of a traditional blonde ale made with a blend of Eastern European Pilsner Malts. Lemon, Floral and Dry flavors. Crafted with 100% malt, our Gold Medal winning Barleywine aged in Brandy barrels. Our blonde ale infused with the natural flavors of lemon and lime. The bright and sunny beer that you'll fall in love with. Miraculum IPA, Royal Raspberry Sour, Mass Haze-teria and Main Squeeze are available throughout the metro area in 16 oz cans. Our 2019 drafts, cans, and limited run beers are available to view in our 2019 Beer Release Calendar below. Fried dough bites tossed in cinnamon and sugar served with Dublin Dry Stout syrup. Sign up with your email address to get updates on taproom events, beer, and exclusive access to special offers and information. We'll send a confirmation email shortly.